Why would a pragmatic progressive that wants to move Austin away from car-dependence oppose an investment in light rail? In brief, because the details of this proposal mean more sprawl and lower transit system ridership. 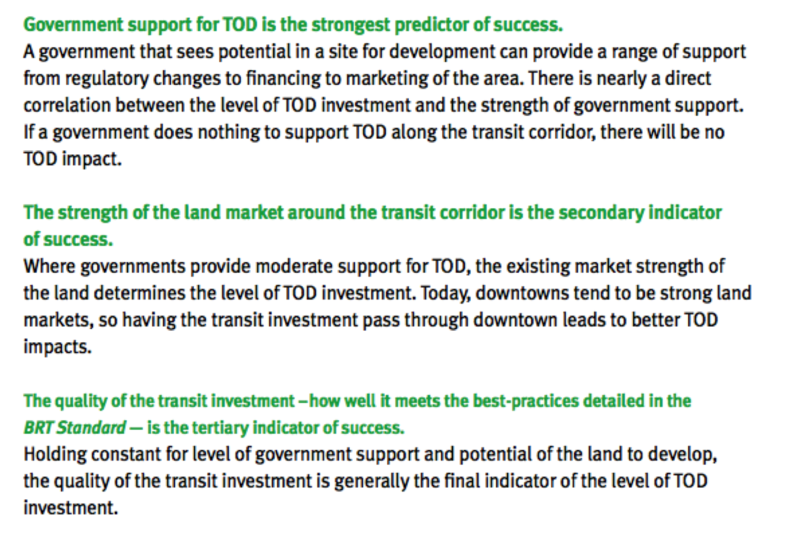 Here is the pro-transit, anti-Proposition 1 perspective to Frequently Asked Questions about this November’s bond. If you are short on time, here’s the 1 minute version of this FAQ. You are voting on authorizing $600 million for the construction of a light rail line that serves East Riverside, the eastern University of Texas campus, the Hancock Red Line stop, and the prospective redevelopment at the former Highland Mall. Only a portion of the $600 million may be spent on design and engineering tasks before the federal government provides a match through its transit infrastructure fund (‘New Starts‘). Some other entity like the State of Texas could also provide the match, but that is extremely unlikely. Here’s a copy of the ordinance defining the bond language (document). The design and engineering portion is expected to be roughly $50-70 million according to Austin Transportation Director Robert Spillar. There’s also a second condition to the release of the full $600 million besides a federal match. The City must fund $400 million in roadway projects of “regional significance”. The $400 million is most likely to use a type of City debt called “State Highway Infrastructure Bonds”. Texas cities can issue them without voter approval. If Proposition 1 fails, the next Council may still issue the $400 million. 1. A new interchange at I-35 and Riverside needed for rail that will also develop new access ramps into downtown. Cost estimated at $120 million. 2. Oltorf, Stassney, and William Cannon interchange replacements with improved frontage road access. Cost estimated at $90 million. 3. New SH 71 connectors to Bergstrom Airport along with portions of track bed, structures, and drainage necessary for future rail extension. Cost estimated at $81.5 million. 4. New overpass at 183 and East Riverside. Cost estimated at $34 million. In addition, there’s a $30 million ‘Regional Transit Management Center’ where signal management and inter-agency coordination will happen, as well as $44.5 million for 10 different studies of roadway improvements and future rail corridors. The above projects and cost estimates are based on the Council-adopted 2014 Strategic Mobility Plan (document). While there are many “system” maps floated by advocates of Proposition 1, the actual hard infrastructure improvements you are voting on are mapped below. Yes, that’s it for this November. The rest will depend on other sources of funding. Compared to buses, rail has much higher initial capital costs (because it requires very pricey tracks, bridges, and tunnels whereas buses use existing roads). Light rail also has high fixed costs (track maintenance, insurance) relative to buses. But it has low variable costs. With light rail one can stack a bunch of passenger cars and serve them with the same engineer and conductor. With bus, each vehicle requires a costly driver. 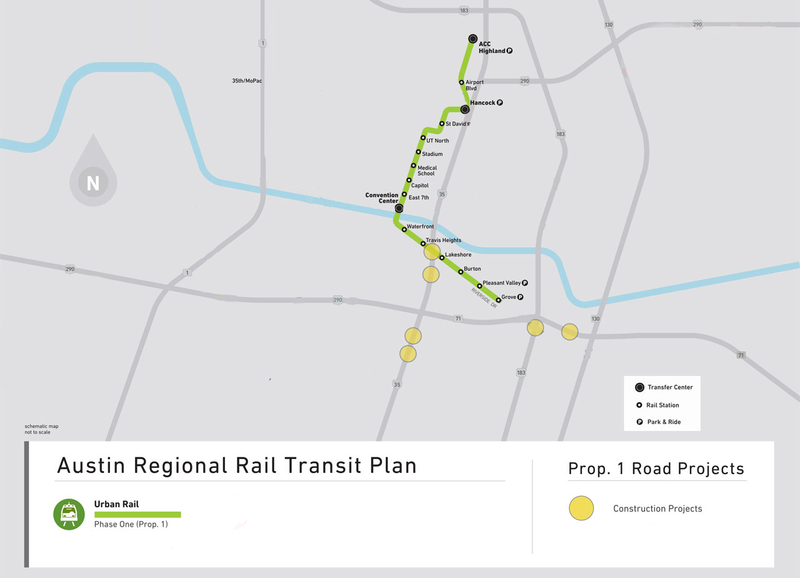 Nancy R. Edmonson – the well-respected Project Connect consultant that developed their cost estimates – indicated that a light rail service hour in Austin would cost $435, whereas a CapMetro MetroBus hour costs $108.75 (memo). Light rail makes economic sense when ridership levels are high enough that it would be more expensive to use a mini-fleet of buses for a route instead of just stacking rail cars. Rail is for scale. The problem with the ER-HL light rail proposal is that its corridor can’t realistically develop in such a way that it achieves the ridership levels necessary to make rail worth it. In 2030, it is projected to get 16,000 daily boardings. That’s about the same number of boardings as the present-day regular bus ‘1’ and MetroRapid ‘801’ routes that serve the Lamar corridor. 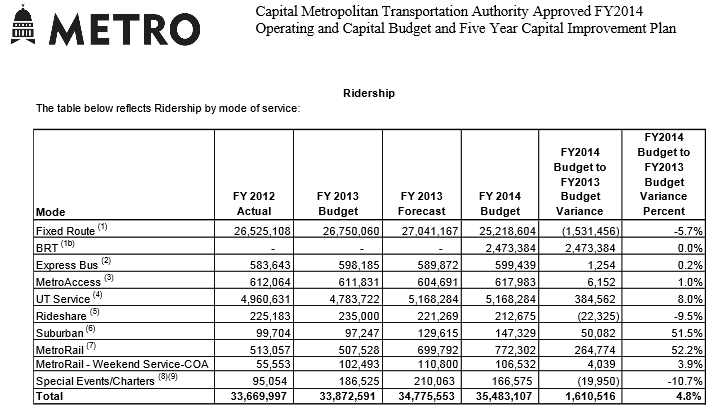 That ridership figure is indicative of a good bus corridor, not light rail. Houston’s Red Line, which Proposition 1 advocates hail as model, opened in 2004. Like the Proposition 1 route, it’s also a bit over nine miles. It has a similar cost structure. And it had 32,000 daily boardings in its first year. Yes, you read that correctly; Houston’s starter light rail line had twice the expected ridership of Austin’s even though they will be separated by 26 years. When light rail is not at scale, it consumes a tremendous amount of resources that would be better used increasing the frequency of productive bus routes. 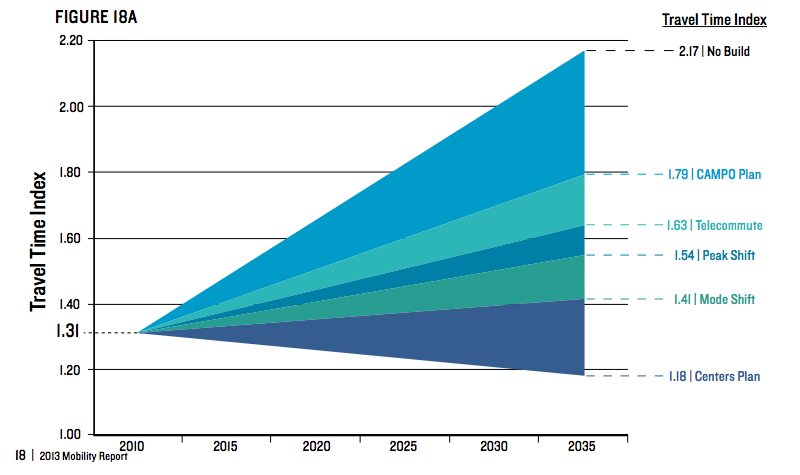 Determining the precise impact of this trade-off requires examining several factors. Project Connect skipped doing this basic analysis; but they did release enough data for it to be calculated. After crunching the numbers (click here for the details), it’s clear that the proposal will reduce overall system ridership by substantial amounts. The chart above visualizes the results of examining how rail’s high cost-per-net-boarding reduces system dollars available for investing in the most productive bus service opportunities. Of the 644 scenarios considered, the median scenario estimated the net destruction of roughly 17,000 daily boardings. That includes the new ridership exclusive to rail. 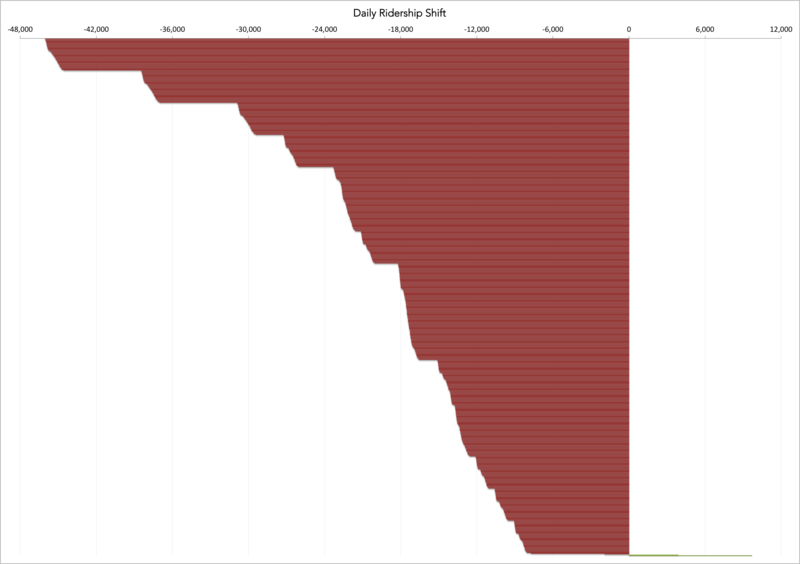 To contextualize: 17,000 is the daily ridership for our most productive bus corridor (1/801). Even if population growth continues in the corridor in perpetuity at the rates estimated by Project Connect (roughly 2% for East Riverside and 3.7% for Highland), it would take decades for light rail to get to scale and start being helpful to the system. Certainly, for those riding ER-HL rail it will be a nicer experience. But other than that, the mismatch between the economics of rail and the corridor it is slotted to be deployed in means that fewer people will be riding transit system-wide. To get at an intellectually honest answer of what it will cost you, we’ve got to discuss what exactly you are paying for. Assuming the Proposition passes and Council chooses to issue the roadway bonds, there’s a total of $1 billion in bonds that the City has to service. I personally spoke to Greg Cannally, the City’s Deputy CFO, to figure out what the interest portion of that principal would be. Given likely rates of 3.5% to 4.5% and a 20-year term of the bonds, that $1 billion in debt turns out to be around $1.5 billion in nominal dollars that must be paid once interest is included. About $75 million in nominal dollars must be paid in debt service each year during the 20 year life of the bonds. Your portion will depend on the mix of the assessed value of property in the City and the rates Council sets in the future; these are pretty hard to predict with complete certainty. But Canally and his team created a reasonable, thoughtful projection that saw long-term assessment values growing at an annual rate of 3%, and population growth slowing (not ceasing) from the recent boom (document). The Canally presentation and a later update (document) expect that 6.25 cents per $100 of assessed value in new property taxes will be needed to cover the aforementioned $75 million in new annual debt service. Therefore, if you have a $500,000 assessed value property, you’ll have a bump of $312.50 annually for the next twenty years if the bonds are all sold at the same time. In reality, they’ll probably be sold gradually, but the total you’ll pay will be the same even if it is stretched out a few years. The total adds up to $6,250 nominal dollars (inflation will eat away at their value) for that $500,000 assessed value property. Your portion could be higher or lower depending on how your property’s value fares relative to the rest of the City. If you have a property that becomes very valuable, you’ll likely pay much more over the time the Proposition 1 loan is being payed. If your property’s value is in relative decline, you’ll probably pay less. The key takeaway is the scale of the annual outlay – a few hundred dollars. Personally, I don’t view that amount as catastrophic damage to Austin’s affordability, but I do see it as sizable enough that we have to make sure it is a high-quality investment given the paucity of support by the state for infrastructure. The City’s bond capacity is determined by the existing tax rate, state law, and financial ratios, among other factors. At the current FY 2014 tax rate, the city has no new bonding capacity. The $600 million in public improvement bonds for Urban Rail and the $400 million in general obligation debt for roadway improvement projects (expected to be provided through the issuance of non-voted state highway improvement general obligation bonds), would require an estimated increase to the tax rate of 6.25 cents (assuming growth in taxable assessed values). State law dictates that the city’s total tax rate cannot exceed $2.50 per $100 of valuation. The city’s current FY 2014 tax rate of $0.5027 is below this threshold. Austin taxpayers can legally tax themselves five times more that the current rate, so there’s technically a lot of room for additional capital projects even if what officials call “bond capacity” is presently maxed out. That said, there are political and market tradeoffs to further expanding our bond capacity. The political tradeoff is that we are substantially increasing the portion of our local tax rate focused on paying debt service. According to this presentation (document) by the City’s Chief Financial Officer (Elaine Hart) and Deputy Chief Financial Officer (Greg Canally), our current property tax rate dedicated to debt service is roughly 11.71 cents; it would have to go up 6.25 cents. That’s a 53% increase. 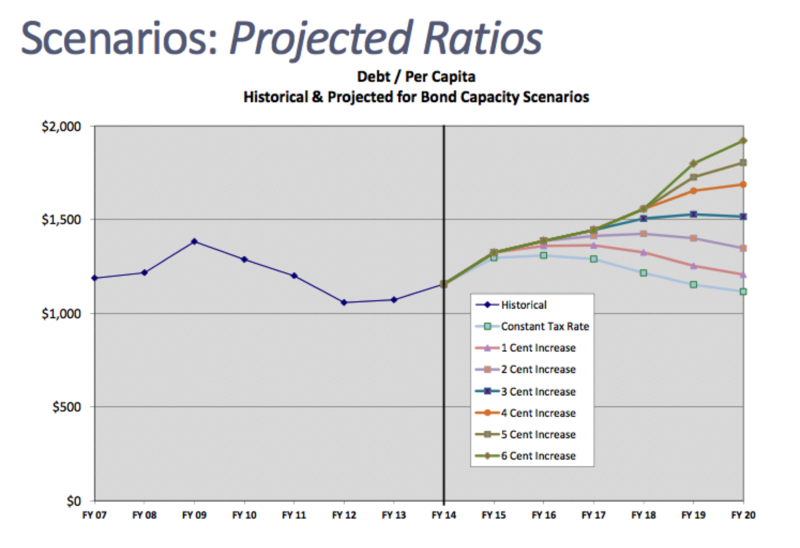 Given other anticipated capital expenditures, Proposition 1 would move us very close to the $2,000 debt per capita threshold at which Hart & Canally cautioned some bond rating agencies might place additional scrutiny on our fiscal health, which in turn might increase the City’s cost of borrowing. This represents the market tradeoff. The chart below is from their presentation to Council. There are many other large infrastructure initiatives we might want to undertake not only in transit, but also in water, housing, open space, electricity, biking, and basic sidewalks. Adding this project might delay or prevent those other infrastructure projects if either taxpayers become resistant to additional spending or the bond market hikes up our interest rates a tad due to our total level of debt. In my opinion, the former is quite likely; the latter much, much less so. Keahey’s answer reflects a well-established view within transportation policy circles that in growing regions, roadway capacity will quickly be consumed by future residential growth. If congestion eases, housing developers will match new demand by building on cheaper, undeveloped land, creating sprawl. Roadway capacity tends to be fledgling and ultimately self-defeating as congestion relief. It’s self-defeating because it allows for additional construction of residential sprawl that then worsens congestion as the choke points in a roadway system – such as exits to job centers – have to contend with even greater loads of cars arriving from increasingly far-flung destinations. This process even has a name in transportation policy circles: induced demand. Even if every single one of the rail-eliminated trips was on I-35, the reduction would barely scratch 4.5% of today’s daily total. As long as Austin grows, any roadway capacity tempts development towards the periphery of the City. An important wrinkle: several of the road projects are actually required to make rail work. The most expensive of the roadway projects – the East Riverside interchange – is necessary to create the space for rail to properly work. The 71 project is a mix of providing relief at choke point and preparing expansion of rail to the airport. The other projects focus on bottlenecks in the road network. Overall, the effects are so modest that no estimates for the reduction in travel time were even released. These are more akin to routine upgrades than transformational investments. Many individuals and groups support alternative strategies to both reducing congestion and providing greater transit. Among the alternatives: using MetroRapid instead of light rail in the ER-HL corridor, deploying light rail on Guadalupe-Lamar, focusing on land use reform and congestion pricing. I’ve also outlined an alternative capital spending agenda based on proven projects. My alternative capital plan demonstrates that our problem is not a lack of good projects. Rather, it’s finding the political will to chose the most effective ones. Perhaps the most interesting set of alternatives are actually being advanced by the leading backers of Proposition 1 rail – the Greater Austin Chamber of Commerce. Their recent Mobility Report 2013 (document) outlined five strategies: building road and transit infrastructure, supporting additional telecommuting, promoting flex scheduling at peak times, increasing transit/bike/pedestrian commutes, and changing regional land use. The first strategy costs roughly $28 billion and includes the items in Proposition 1. All of the others save for land use reform are zero-cost; they are behavior changes. Land use reform would potentially save money by reducing the cost per capita of infrastructure maintenance and government service delivery. The chart below details the impact of each strategy on a metric called “Travel Time Index“. Notice that the four low-cost strategies produce greater results than the $28 billion one. From all of these ideas, it is quite possible to envision a cost-effective set of alternatives that don’t involve sprawl-supporting roadways and a net reduction in transit ridership. All of the claims about the potential impacts of rail on development of the corridor seem to overlook that the plans (such as the medical school, UT’s East-ward expansion, or the RedLeaf redevelopment at Highland) are already underway and influenced by many other demand factors besides a potential rail line. The negative impacts on system ridership levels and tax bills are definite; the marginal impact on economic development that is uniquely driven by rail is speculative. 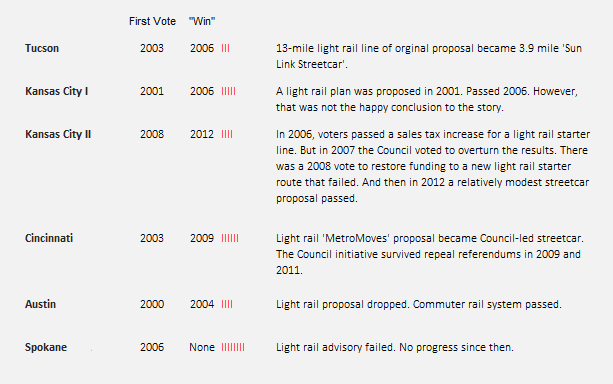 Here’s a chart that outlines recent defeats of light rail and streetcar plans and the subsequent outcome. As you can see, sometimes there’s an interval of six or so years. But it’s certainly possible – and quite likely – that in Austin we won’t vote for another ten years or so. And that is OK. Light rail is just a tool for improving mobility. It is not the end itself. It should not be pursued as a trophy. We just don’t have those densities in enough places in Austin to build a rail network anytime soon without an apocalyptic impact on the larger bus service system. Remember, bus service is 93% of current CapMetro services and the dominant foreseeable future service even after an initial rail line. Some proponents fiercely believe that rail is necessary to encourage transit-supportive density on the route served by Proposition 1 rail. But if you look at the ridership estimates from Project Connect itself (16,000 boardings in 2030, which is eight years after the start of the line) it’s obvious that even their models that account for this “shaping effect” can’t project enough ridership to make this a cost-effective investment. Remember, according to Project Connect’s own estimates, Bus Rapid Transit (basically MetroRapid with more dedicated lanes) would achieve 95% of the ridership of rail. This is an important tell: there’s not enough density in the corridor, and almost all of the people who will use rail are so transit-dependent that they would use bus-based service anyways. The marginal benefit of rail is minimal. This is a powerful argument that appeals to a certain interpretation of wisdom based on long-term thinking. The problem with the Year 31 argument is that it depends too much on assuming the distant future will be based on our interpretation of recent trends. It places one big bet on a brittle hypothesis, instead of many smaller, high-quality bets on compatible but independently virtuous strategies. As you cast your vote on Proposition 1, consider which approach will prove more resilient given uncertainty about the living preferences of future generations, constant technological change (e.g. self-driving cars), and the not-fully-understood ramifications of global warming on our region. If you want another pro-transit, anti-Proposition 1 viewpoint, checkout worsethannothing.org. This FAQ will be updated before election day. Want to make a comment? Tweet at the author or comment on Facebook.